from Belgium, near Brussels. Marina has been very active in the international scene and has organised a great many of international meetings. from Essex, England. 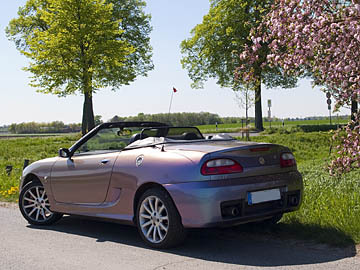 Adrian used to serve as the international liaison officer of the MG Car Club’s MGF/TF Register for many years. He has been to hundreds of places across Europe and knows international touring by heart. Adrian owns another Special Edition of the TF, an 80th Anniversary. from Bristol, England. Colin has taken over Adrian’s office as international representative of the MGF/TF Register. He is also known everywhere for attending every possible international event. from Schwalmtal in the Far West of Germany. 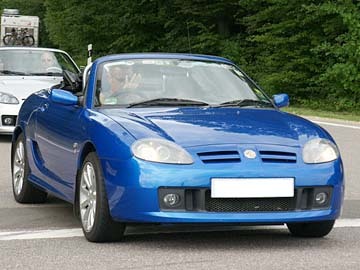 Michael has only been infected by the MG virus in late 2010 but has become an absolute maniac about the cars and the marque of friendship. 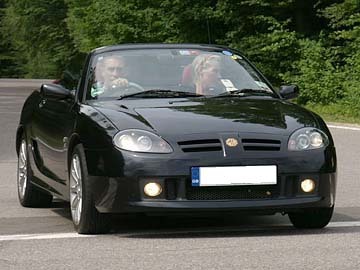 Michael has an MG ZR (with tow bar!) as daily driver and a Monogram TF in Spectre for the summer. They are joined by the local organisers af each event who will be responsible for the actual route layouts, choice of places to eat and landmarks to visit.